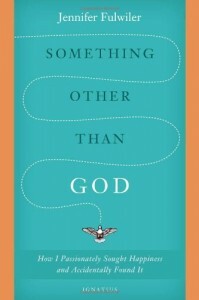 I have a bone to pick with Jennifer Fulwiler: she kept me up late for about week reading her book, Something Other Than God. And we’ve got four kids aged five and under, so sleep is at a high premium around here. I wasn’t planning on reading Something Other Than God at all right now. I definitely wanted to read it at some point. I’ve followed Fulwiler’s blog for years. I first started reading her stuff for the laughs (she’s the Jim Gaffigan of bloggers, only with scorpions instead of fast food), but it’s her insights that kept bringing me back. She has an uncanny ability to capture the zeitgeist floating in the ether all around us that we’re all breathing in all the time without realizing it, and crystallizing it in prose so we can bring it out into the light where we can take a good look at it. For example, I saw her once on Life on the Rock and she said that before her conversion to Christianity, she thought the key to happiness was to amass as much control over her life as possible, then meditate really long and hard on what made her happy, and then go and do it. It was an “ah-ha” moment for me, and once she’d articulated the thought, I saw how the “first I’ll get rich, then I’ll do whatever I want, then I’ll be happy” mindset was in operation all over the place (though I only spotted it from afar, of course). See her “22 Things I Learned in My First Ten Years of Parenting” for more examples of her pithy wisdom. So I was definitely planning on reading Something Other Than God—sometime. But with a new baby, a birthday for another child, flooding in the basement, a yard needing some serious TLC, etc., this just didn’t seem like the time to start a new book. Then I made a mistake. Literally as I was putting the book up to await more propitious circumstances, I decided to just crack it open, turn to a few pages at random, and skim a bit here and there to get a little flavor of what I could look forward to when I had more time. That was all it took; I was hooked, and all my free time, and a lot of my sleep, went out the window. From then until the book was finished, I passed my days bleary eyed and sleep deprived, going about everywhere with the book tucked under my arm, waiting for odd moments at the park or school pick-ups to keep on reading. There are a lot of intriguing aspects of the book. There are the pairings that just make you think—and sometimes pray. Like a four year old paired with a war hero. Two women both using a powerful drug to deal with a dangerous medical condition and the struggles those medical contingencies bring with certain Church teachings. Two people sitting together at a trendy restaurant, each deciding to embark on a new life. How all these stories unfold in juxtaposition with each other is telling. Then there are the arguments: Fulwiler has an analytic mind, and she brings her bristling intellect to bear on some tough problems, analyzing them from many different angles. And she’s stubborn. She kicks against the goad, and doesn’t accept easy glosses. Then there are the beautiful images: some passages of the book read like literary icons, deep with meaning, giving up more and more insight the more you contemplate them, whether it be a cliff with embedded fossils, a trip to the pharmacy, or a scrap of white napkin carried away on a breeze. 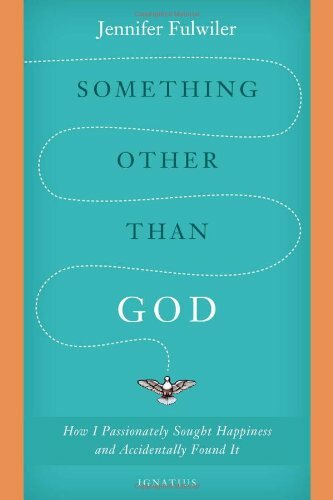 There are the ideas, sometimes startling: like maybe the problem with coming to know God isn’t so much with God as it is with . . . me. Or maybe that it’s not so very impossible to even imagine how some of the great evils of the world came to pass, if we see ourselves with a little more clarity. Or to recognize the limits of understanding through thinking alone, and the need to do as well as consider. But what was more powerful for me than all those things was simply the story of two people and the struggles they faced on their journey. A journey at times joyous, crazy, silly, and hilarious—and at times very, very difficult. I found myself rooting for these two people, wondering if they would make it, hoping that they would, and snatching whatever time I could to keep on reading to find out if they did. It’s a book which has stayed with me since finishing it. I find myself going back over certain pages, certain images, certain ideas: thinking, contemplating, seeing new things I hadn’t fully understood before. I think that it will be one of those books that will stay with me for many years to come. I know it’s one that I’m so glad that Jennifer Fulwiler made the effort to write.